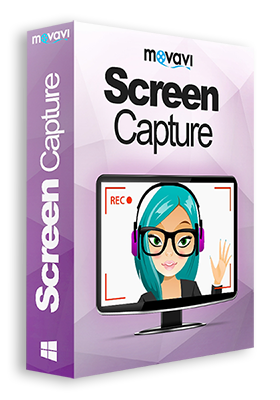 Introducing Movavi Screen Capture – the friendly program which makes video creation so easy! The product we think would suit your needs best is Movavi Screen Capture – available for both Windows and Mac, it combines a friendly interface with high quality video production. Using Screen Capture is easy as 1 – 2 – 3! Position the capture area over the animation. Play the animation and click Record! And here’s the detailed walk-through on using Movavi to convert PictraMap animations to videos. Step 1) Download Movavi Screen Capture. As I said, to meet your needs and make video capturing easy, we partnered up with Movavi. For a limited time, you will get a 20% discount as a fellow PictraMap user – use promo code PictraMap during checkout! Use coupon code PictraMap for a 20% discount during checkout – expires soon! With Movavi Screen Capture you can record, trim and save the animations as video. However, if you also want to add special scene transitions and effects, you should try Movavi Screen Capture Studio. In terms of recording, the Studio has the same capabilities as Screen Capture, but on top of that it features a powerful video editor. Step 2) Setup Screen Capture for recording. – Set the capture dimensions to 1280 x 720 (this is standard High Quality resolution). Manually resize the browser window with the PictraMap animation to fit in the area highlighted in orange. Be sure to capture the PictraMap watermark in the bottom left corner of the screen – only Ultimate account holders have watermark-free animations. Thank you for not violating our intellectual property copyrights by removing the watermark during screen capture. – Open the Screen Capture video options by clicking on Settings -> Preferences -> Video. 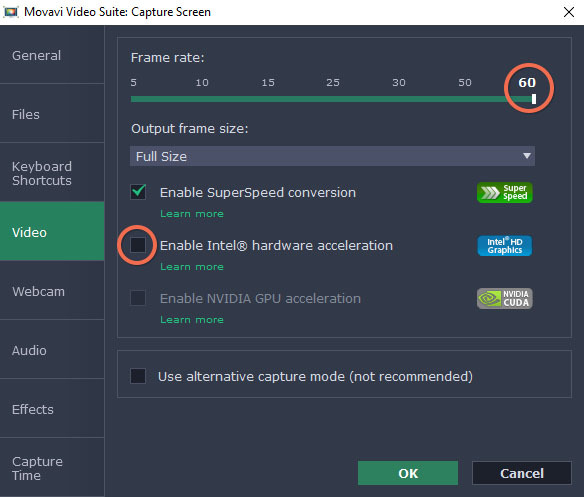 Set the frame rate to 60 frames and deselect “Enable Intel hardware acceleration” (if it is selected). Step 3) Play and record the animation. – Don’t worry about timing the beginning and the end precisely; you can cut what you don’t want from the video afterwards. – To capture a smooth animation, play the PictraMap animation once before you start recording it. This will cache the images in your browser and should produce a smooth animation without glitches. After that just reload the page and start recording! Step 4) Save the video. – For best quality leave the “Save as” setting to the first option. This way no additional encoding will take place – the resulting video file would be larger, but with better quality. – If you would like to cut part of the beginning or the end of the video, now is the time to do that. It is very easy – just scroll on the timeline to the place where you want to cut and press the scissors button. After that click to select the unnecessary part of the video and click the trash can button to delete it. Easy as pie! That’s it – now you have a way to convert your PictraMap animations to videos in a few easy steps. 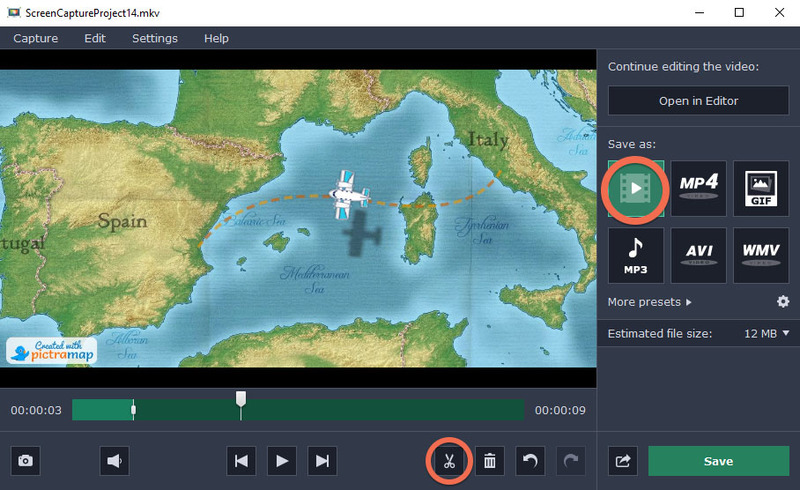 If you upload your videos or use parts in larger custom-created videos on your blog, YouTube, Vimeo or other 3rd party website, be sure to include a notice in the description that the travel animated maps used for the production of your video were created with PictraMap at https://www.pictramap.com. Use coupon code PictraMap for a 20% discount – time-limited offer! Jordan is a freelancer who plays and creates games for a living. Loves travelling, movies, mixed martial arts and chilling out in beach bars (preferably with a laptop close by). Basically a nerd who can beat you up. Loves beer, hates pollen. Join here to stay in touch! Is there any way to create a video on a Mac? Hi, Wayne – sure thing! There is a link to the Mac version of the tool on each product page – for your convenience, here are the direct links for the two products mentioned in this blog post: Movavi Screen Capture for Mac and Screen Capture Studio for Mac. Thanks for using PictraMap and let us know if you have other questions or need assistance! You can also use the QuickTime Player that comes with Mac OS! Just open QuickTime Player and select New Screen Recording from the file menu or right click on the QuickTime Player icon in your Dock and choose New Screen Recording from that menu. Thanks for your comment, Chris, and for mentioning this free tool for Mac users. It’s fair to say though that with Movavi you have more settings available for the screen capturing and depending on the Movavi product you choose, you may also have video editing options. All in all, after testing multiple free and premium solutions, we found Movavi brings the best value for money – higher quality at a reasonable price, that’s why we recommend it. Hi Rahul – I am sorry you are experiencing problems with Movavi. We recommend the program for best quality for money, but we are in no way associated with them so I cannot answer your question. You can try and reach out to their support – they should be able to help. I was very excited to find this site. 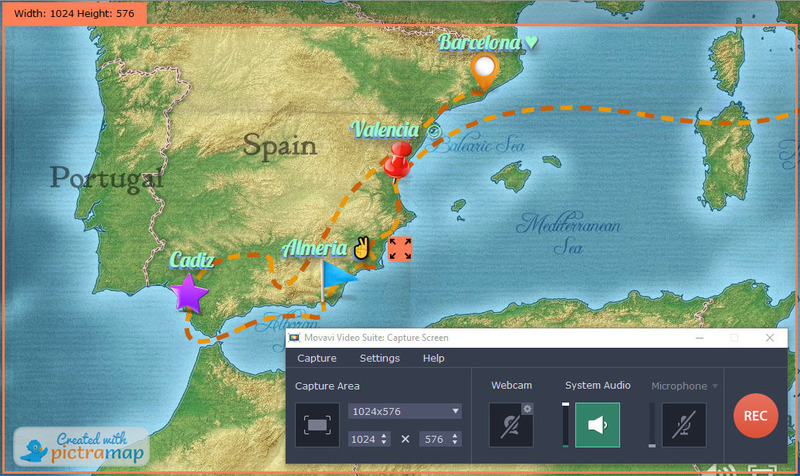 Finally a stand-alone site to create animated maps for video production. Beautiful. Simple. Easy to use. But now I have to purchase yet another program from an entirely different vendor to make your product work? This is pretty much a deal-breaker for me. Hi Terrance, thanks for your comment and positive feedback about the platform, glad you like it. If you however need to export the animated maps as videos, then yes – you will have to use a third-party software to screen capture the animations produced with PictraMap. But you don’t have to buy Movavi – if you have a screen capturing program of your own, you can use that one instead. We recommend Movavi to anyone who doesn’t have a similar program because of its good price/quality ratio. Converting the animations to videos is our most requested feature though and we are in the final stages of development and testing a built-in feature to do that. While I cannot give you exact release date, I can tell you it’s a matter of weeks. If you cannot wait for such a feature, an alternative you can use is screen capturing the animation – as outlined in this post, with Movavi or another screen-capturing program. If you do screen capture the animation or parts of it, and use it on YouTube or another video sharing platform, your own blog or some other online venue, please be sure to follow the copyright rules outlined in our Terms of service and in this blog post we’re commenting on. Hope this helps and thanks for using PictraMap! I want to know does buying the subscription gives you an option to remove the Pictramap watermark on bottom left and big Facebook Icon on bottom right? What is the procedure to use it in YouTube Videos. Hello Shaz, only Ultimate subscribers enjoy animations free of the PictraMap logo in the bottom left corner and FB logo in the bottom right corner. Thanks for the reply. Just one more question. Can I just buy one month membership make my map animation and no renew it next month. Will I still retain the animation rights to use in my video with all info mentioned in description below ?